Capitalist Dystopia Part 2——-A Voyage to the Dark Heart of Capitalism or what can Joseph Conrad tell us about commodity fetishism? If you scoured the globe looking for a location to film a post-apocalyptic dystopia, you might on visual grounds alone choose Agbogbloshie, the toxic scrapyard in Ghana where computers go when they die. At this technological graveyard, one can find workers from northern Ghana and the Ivory Coast scavenging through discarded motherboards, damaged keyboards, cracked television monitors, smashed microwaves, and broken cellphones for resalable materials. Fires dot the landscape as piles of ruble are set ablaze in order to disclose the precious copper and aluminum. Pollution seeps into the water and air. Crime is rampant and many of these workers will end up sick from toxic fumes or plagued with later health problems. It doesn’t take much effort to imagine Agbogbloshie as specifically post-apocalyptic science fiction. While it has long been a racist cliché to depict Africa as a place that time forgot, Agbogbloshie looks like the future that might appear after a disruption of our world-system. But this e-waste graveyard isn’t capitalism breaking down, instead it is the ordinary functioning of the current system. Indeed, few places showcase the impasses of the system better. This is what makes Agbogbloshie so important for my larger project (to get caught up see the initial prompt “Is it easier to imagine the end of the world than the end of capitalism?” and Part I- “The Janus-face of Capitalism or Is Walmart Utopia?”). By way of explanation, the term “capitalism” is often tossed about as a vague and intimidating abstraction either celebrated as the essence of progress and wellspring of modern civilization or condemned as the cause of all the world’s ills. But almost nobody agrees on the definition of capitalism or when it first came into being (if ever). [a] Plus, because our current world-system is so vast and complicated, our current problems are maddeningly difficult to even begin to diagnose. So even if you feel a sense that things are wrong, the scale alone might seem to make improving the world neigh impossible. You’ll get a more explicit definition (or two) of capitalism in a later post. But here I’d like to try to grasp the dystopian inherent in the totality of the current-world system and figure out why precisely it is so hard to have sense of the objects in our world and their relationship to this system. To do that, if you’ll follow me across the fold, I’ll explore what Conrad’s Heart of Darkness can tell us about Marx’s concept of commodity fetishism. 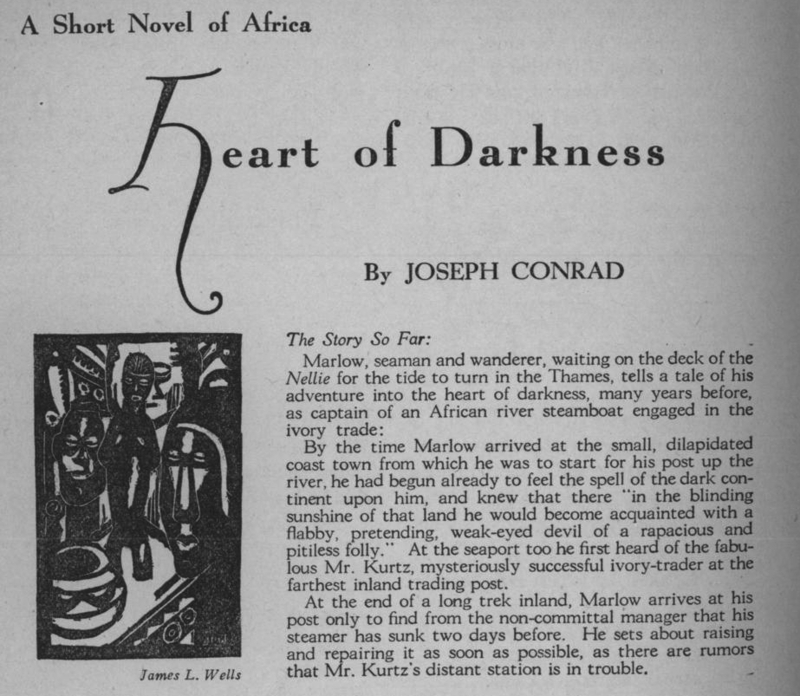 Perhaps because of its established place in the American classroom, Joseph Conrad’s Heart of Darkness (1902) has been subjected to a range of thematic interpretations. If you need a reminder, the basic narrative of the novella concerns a British sailor (Charles Marlow) who is hired by an ivory trading company to guide a steamship into the heart of the Congo. The journey forces the protagonist to confront harsh truths of the European presence in Africa, which in turn puts pressure on the distinction between supposedly civilized and savage worlds. The most conventional reading of Heart of Darkness sees the work as a criticism of European imperialism. But I’ve always found that interpretation rather simplistic insofar as Conrad gets most of his ironic effect by juxtaposing what he describes as the nobility of the colonial idea with its horrors on the ground. [i] Hence, Conrad at least partially preserves, rather than criticizes, the ideological aspirations of the colonial project. Moreover, by building his narrative on the suffering of abject Africans, which he portrays as in need of salvation, he might actually seem to be reinforcing the idea that Africa needs European colonization or intervention even if framed in a liberal form (it would seem there is at least some truth in Chinua Achebe’s “An Image of Africa: Racism in Conrad’s Heart of Darkness“). But I think the question Conrad is asking is not “why is colonialism wrong?” but “what prevents the implementation of colonialism’s ideals?” His answer is primarily that human nature is flawed and easily corrupted by acquisitiveness, lust, and avarice. [ii] But it is the particular target of human greed in Heart of Darkness that opens it up to an unintended Marxist reading and indeed it is this feature that makes it an exemplary introduction to the horrors of capitalism more broadly. Simply put, look at the novella’s most obvious metonymy: “ivory” is the key. This is Conrad’s analogue to Marx’s commodity fetishism (Warenfetischismus). Many non-specialists seem to think that “Commodity fetishism” is Marx’s description of a particular lust for consumer products. This couldn’t be more wrong. Marx is not discussing a proto-Freudian sexual hang-up, but an analogue between modern capitalism and what was then taken to be the quintessential African religious form—“fetishism,” or the belief that certain manmade objects possessed spiritual or magical powers. [iii] In brief, Marx’s commodity fetishism describes how a particular object in a capitalist society takes on an exchange-value (or commodity-form) independent of its use-value or any of its particular physical qualities. [iv] Moreover, this abstract exchange-value obscures the concrete labor that went into producing the object. So we see the object as though it—not the labor that went into producing it—is the barer of value. Marx is basically arguing that consumer objects are enchanted with a commodity spirit-body that stands-in for its commercial value. To provide a concrete example, the price of a diamond ring comes not from how practically useful it is (you can’t do much with a diamond ring except scratch glass), nor does its price precisely correspond to the specific form of labor that went into producing it. To simplify, the price comes from how much money people think other people will pay for it. But the irony is that the price appears to be a relationship between things (this ring is worth 5000 dollars or this ring is worth half a motorcycle) not between people. One of the lessons of Marx’s example is that objects are produced by a whole hidden histories of social relations and part of the function of critique is to decode the “social hieroglyphic” that obscures this history. To understand Conrad’s repeated references to ivory, you have to know that there was a boom in Euro-American consumption of ivory in the latter half of the nineteenth century. [v] In 1798, American silversmith Phineas Pratt had discovered a technique for the industrialized production of ivory combs and in the years that followed his descendants expanded the operation to produce piano keys, toothpicks, buttons, dice, and billiard balls. It was these ordinary objects that drove the global ivory-trade. This stark image of exploitation illustrates the human cost of producing the ivory comb. While it is true that depictions of starving Africans were often used as racialized clichés to justify further European colonialism, in my reading Conrad is interested in something else–the fact that part the way that the capitalist system functions is through a kind of willful ignorance or evil banality such that a given person in the supply chain needs only know that the next person over is slightly less ethical than themselves. Plus, those at each stage feel exploited or often in some sense victimized by the person immediately above them in the corporate hierarchy, which partially serves to explain but not necessarily excuse their own role as victimizer. In Conrad’s spatial metaphor this means that practically at each stage up the river one gets closer and closer to the necessary horrors that are the heart of the violence inherent in the commodity. Conrad refers to this end point of extraction in terms of the ivory trader Kurtz, who as far as management is concerned is a just a “remarkable person” at the “bottom” of the system who sends a lot of ivory back to corporate headquarters. With little effort, the corporate leaders (and consumers) can excuse their ignorance of the real human costs of the goods and engage in a kind plausible deniability. According to this reading, Kurtz’s darkness is nothing less than the global system of capital that devoured him even as it made him its instrument. Heart of Darkness is not merely of antiquarian interest because we can run a similar operation on the basic artifacts of the contemporary consumer world. Restated, we can update the story for our current world. The best contemporary adaptation of Heart of Darkness would not be to turn it into a metaphor for American military imperialism (as much as I love Apocalypse Now), but as a history of a particular commodity. So that instead of beginning on the Thames and tracing the implicit history of an ivory piano key, we could start from a modern commodity to trace back the systems of exploitation, violence, and environmental degradation that produced them. One way to update Heart of Darkness would be to imagine a protagonist working for a major fast food company tasked with figuring out the sources of some contamination in the supply chain. This version of Marlow would begin with a simple hamburger and then trace it back to semi-unsanitary transport conditions, the horrors of industrialized meat production, the pollution of factory farms, the wasteful slaughter of animals, disreputable packaging techniques, and then to perhaps to the terrible lives of agricultural child laborers in the United States that produce our low-cost fruits and vegetables and so on. It would show that the American heartland has its own dark core. This version of Heart of Darkness would be good, but it might produce the sense that dietary reform would alone be sufficient to solve the world’s problems. And as important as this kind of reform would be, I don’t think would go far enough. The update of Heart of Darkness that keeps me up at night begins with a critical theorist, perhaps a professor at a small college. In this version she either decides to trace the origin of her laptop or is hired by a superficially moral technology company, as an outside consultant to make sure the supply chain of said computer is ethical. She would begin with the local American stores and their lack of unionized labor before tracing the laptop’s history to its manufacture in China. The narrative would follow her ‘upstream’ to a massive factory staffed by underpaid wage labors semi-transients, women (and sometimes children) who sleep in corporate dormitories, work for pennies in long shifts with few breaks under the surveillance of armed guards to prevent them from committing suicide, and then are frequently exposed to harsh factory chemicals all in order to make said computer. Perhaps then it would then trace the origins of say the copper in one batch of computers to Zambia where copper mining produces further harsh human and environmental costs. Or perhaps our fictional version of Marlow would follow the down-cycle history of said laptop to the technological junkyard of Agbogbloshie or more plausibly to its Chinese analogue the “e-waste inferno” of Guiyu, where it is poor Chinese rather than African workers who scavenge through shattered monitors, broken hard drives, and discarded television remotes for hints of profitable materials. Either way, at the end of the line standing in for Kurtz would be a supplier in an e-waste graveyard tasked with exploiting workers to maximize their reclamation of computer parts in order to recycle them. Then at the conclusion of this version, the fictional protagonist would write a blog post like this one. And she would write it on the very computer, which was the product of this massive system of exploitation. To be honest, it is ghosts like these that surreptitiously haunt my laptop. I find this latter version of the Heart of Darkness more satisfying as an intellectual exercise, not only because it hits home for me typing now, but also because in the end, Dear Reader, you are the final consumer of the chain. All of our consumer electronics, give or take, are enmeshed in basically the same system. Whatever device you are using to read this blog post on – your smartphone, laptop, or e-reader – is caught in the same system, such that even reading this act of criticism puts you at the end of a long chain of harm and exploitation as surely as if you were holding an ivory comb in your hand. You don’t have to take my word for it. If you want to see the dark side of the global economy at large – you can find documentary films that portray the environmental and human cost of mining for copper in Zambia (Stealing Africa, 2012), the pain of agricultural child laborers in the United States that produce our low-cost fruits and vegetables (The Harvest/La Cosecha, 2010), the horrors of the industrial meat production process that produces American hamburgers (Food, INC, 2008), and the environmental damage of attempts to extract cheap natural gas (Gasland, 2010). Faced with the parade of images of sick children, polluted rivers, injured workers, and slaughtered animals it is hard not to feel overwhelmed. It would appear that basic commodities are the crystallization of vast (nearly) invisible dystopia being produced a largely to support the consumer lifestyle of the first-world and it is one you are benefiting from by very virtue of the act of reading this blog post if not a hundred other ways. But even this lifestyle is far from utopian. In the next post, I want to show how the first-world lifestyle also contains dystopian seeds. [a] For example, Popper argues that “ ‘capitalism,’ in the sense in which Marx used the term, never existed anywhere on the surface of our beautiful planet Earth – no more than Dante’s hell.” Karl Popper, After the Open Society, p. 398. [vi] Conrad, Heart of Darkness, page?. This entry was posted in dystopia and tagged Capitalism, Commodity fetishism, heart of darkness, Joseph Conrad, Marx by Jason Ā. Josephson Storm. Bookmark the permalink. This is a very interesting (and sobering) post but I think it somewhat implicitly relies on the assumption that the consumers at the end of the chains are privileged Westerners. While that might be a fair assumption statistically speaking and particularly valid for certain products (a certain fruit based company springs to mind), it seems to fail to speak to the remarkable growth of low cost technology in the developing world. While smartphone penetration in Ghana is still low (around 15% from what I can find), this figure is growing and thus it seems perfectly conceivable that the visitor to your blog might not necessarily be at the end of a very long chain, nor might they be particularly complicit in some form of naïve long distance consumption. Africans are now estimated to make up about 20% of all internet users and China is the biggest smartphone market in the world. I don’t offer this as an attempt to deny the obvious exploitation that underpins the behemoth of global production but rather to highlight that alongside the dystopia there is the potential for more positive (potentially unintended) consequences. The growth of internet access worldwide remains uneven but it has still grown from 7% to 32% in developing countries in the space of 10 years. And while access to the internet doesn’t provide some automatic freedom it does increase an individual’s possibilities and their access to knowledge. BTW, in regards your suggested update to The Heart of Darkness, I imagine you have already seen it, but since it isn’t explicitly referenced above… the plot you describe sounds very similar to the dramatised film version of Fast Food Nation. Might be worth taking a look if you haven’t already seen it. Sorry for the delay in approving/replying I was on vacation. Thank you for comments. Very useful! I would agree with you that we should resist seeing the current world-system as bifurcated into privileged first-worlders and disadvantaged developing-worlders. Clearly, there are African elites that fully benefit from cutting edge technologies, just as there populations within the first-world that do not. I’m trying to argue that the inter-looping systems of technology (power), capital, and exploitation that undergird the current world-system have been formulated without regard to national boundaries and it means that there are those benefitted or disadvantaged at different stratums/in different ways even inside a given society. And I think you are right to note that low-cost technologies can make a positive difference in the lives of people who are otherwise getting the short-end of the stick in terms of the global economy. The world-system is not 100% doom and gloom, and I’d agree that some technologies have liberating potentials. I’ve been leaning into the dystopian in this series of posts mostly to set up my excavation of some downright utopian seeds in later on. But I want to resist the assumption (not made by you in particular but generally) that improving quality of life in the developing world to that of the bourgeois first-world solve everything. My resistance is because: A) I don’t believe the current first-world life style could be sustainably globalized, & B) I don’t think life in the first-world is that great. Sure first-world life is significantly better than having to deal with civil war, starvation, and disease, but as I’ll try and argue in the next post it too contains a core of alienation and distress. And I haven’t seen Fast Food Nation (although I’ve heard of it), but I’ll definitely check it out. Thanks for that recommendation too. No problem re: the delay and thanks for the response. I look forward to your further elaborations in the future posts you mention and I also fully agree that improving quality of life should not be equated with the importing of a bourgeois first-world consumer lifestyle. While you have certainly made the case that there is a dark side to the world economic order, I don’t think you have made the case that it is essential. For example, the soot-filled cities, child labor, and dangerous working conditions of the industrial revolution only represented a passing stage of industrialization. Perhaps the extreme disparities of wealth, income, working conditions, and economic security that characterize the present, only represent transient phenomena on the path of progress.